It’s flown under the radar, but perhaps the most dramatic element of Obamacare isn’t changes to Medicare, or the requirement for millions to purchase insurance –- it’s the planned expansion of Medicaid. That expansion would cover an additional 21.3 million people within the next decade, reducing the number of uninsured nearly by half, according to a new report from the Kaiser Family Foundation, an organization specializing in health care policy. While that sounds like good news, the sheer size of the expansion has many people worried about cost. Since the Supreme Court ruled that states cannot be forced to participate, eight states have said they won’t expand their current Medicaid programs, and several others say they may follow suit. But the KFF report says those states may be making life unnecessarily hard for their poorest citizens. Why? Let’s start with the basics: The cost of Medicaid is currently shared by states and the federal government, with Washington picking up a little more than half the bill. Under Obamacare, the feds would carry a much heavier load: 100% of new costs for the first three years, 95% starting in 2017 and 90% in 2020 and beyond. The potential impact is huge. 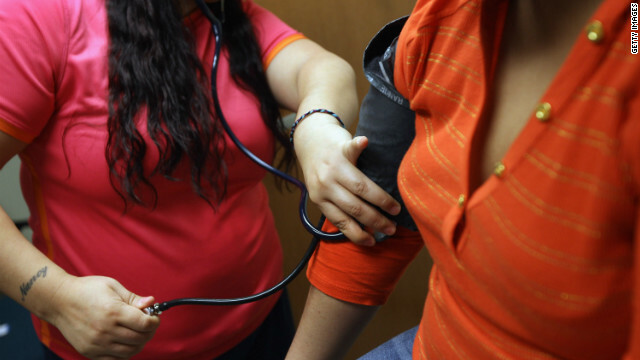 Many poor Americans do not now qualify for health insurance. This holds especially true in southern states, which impose strict income limits. To pick a typical example, in Georgia, a working mother in a family of three is ineligible for Medicaid if she makes more than $9,080 in a year. Under Obamacare, she could earn up to $26,344 and still be insured through the program. But according to the new report from Kaiser, the average cost to a Georgia household would be just $73 a year -– a total of $2.54 billion over the next decade. In addition, Kaiser estimates the state would save $726 million in “uncompensated costs” –- money it now spends to reimburse hospitals who care for uninsured patients for free. The state’s total cost would therefore be $1.81 billion, or $52 per household. For that, an additional 698,000 Georgians would receive insurance. The report paints a similar picture in other states. In general, states that now have generous programs for the poor –- largely in New England and the Mid-Atlantic states - would actually save money through the expansion. That's because they could eliminate some state-funded safety net programs, since the beneficiaries would be covered under the expanded version of Medicaid. Alan Weil, executive director of the National Academy for State Health Policy, told reporters Monday he expects the math to eventually sway governors and state legislators, even where Obamacare has been politically toxic. You can see how the changes would affect your state by reading the full report here. Nope, it's more important to follow your political parties' ideologies and dogma and screw over your poorest citizens. Perhaps some states are refusing to expand Medicaid to force the poor and uninsured out, figuring a flight to states offering coverage. I couldn't let this pass: Poor choice of words being that there's no such thing as "Free Money"! Somebody has to pay for this expansion of Medicaid. "Free money"? Yeah, freed from my wallet. Having been a healthcare provider for a couple decades now, our practice still refuses Medicaid. Sure, it's easy money on the face of it, but I have seen multiple practices brought to ruin because Medicaid patients end up being 50% or more of the patient volume at a practice, yet thanks to Medicaid paying providers less than Medicare rates for patient visits, Medicaid revenues account for only 20%. It's like being at an all you can eat buffet, except that there's only bread and water on the menu. You will eventually die stuffing your face, in the case of medical practices, you will go broke seeing 30+ patients a day per provider. What is going to happen is all of the independent physician offices will close, with the doctors fleeing to the comfort of large clinics and hospitals offering high salaries, management of their staff, management of their patient flow.... In the end (and it's already happening on the East coast) is that patients will be essentially trucked in on cattle trailers to the warehouse clinics (just like the HMO's of the 90's), run through a 10 minute visit where the physician will run a couple of cheap tests, throw pills at you, and hope it gets better (just like the HMO's of the 90's), while withholding more expensive (and needed) testing until it is approved by higher ups (just like the HMO's of the 90's) for fear of losing bonus or "incentive" payments (dare I say it? – just like HMO's of the 90's!). Eventually, enough people will die, and these large clinic / hospital / insurance Frankenhealthcare conglomerates will get sued out of existence (just like the HMO's of the 90's). But, lest we forget, unlike the HMO's of the 90's, this disaster is federal law, so it won't ever go away. Welcome to socialized medicine! Wanna know how well it works? Ask the folks from the former Soviet Republic. Not countries like Canada and Germany, that have the population of California, but countries with hundreds of millions of citizens; Russia, China, India, Brazil..., go ahead, go see for yourselves. You think healthcare is expensive now? Wait till it's free! And yes, I voted for Obama, so spare me the shrill, self righteous, anti-Republican, pro pot, LG (put your sexual orientation HERE) nonsense. I have over 20 years experience providing health services to patients, how many years does our President have? Yeah, go figure. I consider myself a Democrat that admires the likes of FDR, and I am a Republican that admires the likes of Reagan. You can be both, it won't hurt you unless you're stupid, and as any physician can tell you, you can't fix stupid. Yeah, gotta love what Reagan did for the homeless and the psychiatric patients, when he closed the hospitals, and let them out to live under bridges "free" to find their own way through the system, obtain and correctly take their medication(s). Talk about false savings! That is an over exaggeration. It is against the law to help a mental patient without their consent ,,, hmmmm let us than the civil liberty groups for that one. My physical therpaist came this morning, I had to be re-evaulated, hes the head of his company. He told me he will be closing his company by mid June, due to the new Obama health care rules taking place. He said all combined he now pays over 50% total in taxes. He cant afford to continue his business, he told me he will reopen in Mexico with a 2% tax rate and have a better lifestyle. Now if this isnt sad for him, it sure is for me. He said I would probally be forced to a clinic for treatment, now i have to figure how i can even be able to get to one. I never thought at my age, i would be desperate for medical care like this after working my whole life. When will we ever take care of our elders? I hope my kids have a better shot at old age than Im having. Troll. Article is about Medicaid ...Not Medicare! Just like your phony Mexican massage therapist did, get a life! Pretty soon the only people that will be able to afford health care is us big wigs. And that’s the way it should be. We don’t want you little people using up the resources when we need them. And once again, I thank you little people for capping my SS tax at the $110,100 level. Now I only pay 1.1% SS tax and you little people pay 6.2%. Also, thank you for extending my tax breaks. I’m using the extra money on my vacation houses. The truly sad thing is that we have degenerated as a society to the point where people won't even question the concept of "free money". The Founders are rolling in their graves. Thank you for your helpful fdbeeack Jim, I really appreciate it. We will look into the SEO Pressor plugin as you suggested.My wife and I just started and we are learning more as we go along using WordPress. I am interested in knowing how did you find out about our site?Thanks again for your fdbeeack. todas las prendas The North Face: chaquetas, forros, calzado y equipación.|The North Face España.